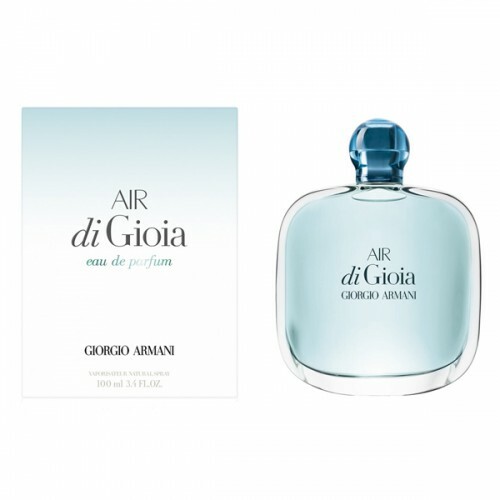 Giorgio Armani Air di Gioia is a refreshing summer women's perfume. Giorgio Armani Air di Gioia 100ml. EDT introduced as the next within a collection inspired by natural elements - water, fire and air. Now Air di Gioia is for independent, strong women who are not afraid to give their surroundings show. And why should they? Are his. Fresh citrus fragrance in the air combines with di Gioia elevating floral aroma. All this complemented the earthy scent of moss and trees, will make you mistress of every situation. Result only underscores the pinch of the exotic, perfumed water that comes an extract from ylang ylang. Sophistication, confidence and self-discipline - it just says Air di Gioia by every woman who wears it proudly. Do not stand on the sidelines and let the world know about yourself with your favorite scent! The powerful air inspired the element to create the composition. Discover this element. Fragrance energizes and allows you to restore the lost connection with nature, to feel happy again. Delicate aroma, which is clearly perceptible Mediterranean breeze. Fragrance notes are invited to carry out a walk along the coast. Sea freshness able to show in this fresh, exciting and light fragrance. Start of flavor - a bright notes of mandarin and neroli covered with sea salt. Notes air and gentle peony flower and light chypre accords are motivated through the whole composition, harmony is approaching, then moving away. We also offer a beautiful bouquet of orange blossom, ylang-ylang with soft pink and green accents. Fragrance composition fills with energy, but at the same time sounds quite delicately.